The Afghan Hound is a sight hound, first recognized by the AKC in 1926. It originated in Afghanistan where it was a hunting dog for royalty, pursuing gazelle, snow leopards and hare. The ideal size ranges from 25-27 inches tall at the withers, with a weight of 50 to 60 pounds and a long silky coat. Any and all color variations are acceptable. While the breed tends to be shy and aloof, it competes well in obedience and agility. 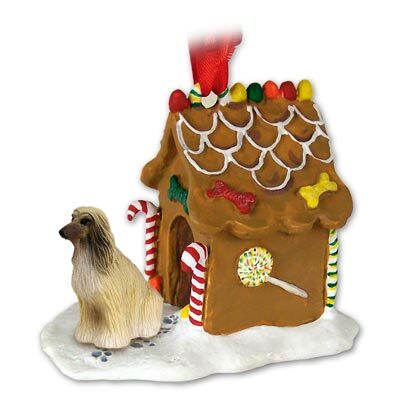 The Gingerbread House Ornament is a miniature three dimensional molded stone resin house, with hand-painted “candy” decorations on all sides, The details are incredible, from the frosting and lights on the roof, right down to the sweet little paw prints in the winter snow! Every ornament has one of our detailed Tiny Ones series of figurines mounted at the entrance of the house, making this miniature scene quite the collectible statue. The base measures 3 ½” X 2 ½” and it stands 3” tall with a bright red ribbon tied in a bow. Perfect for use as a hanging ornament, or a decoration on the shelf. Individually packaged in supportive blister pack ready to give as gift, or hang in your store.